Become an Angel for the Animals by clicking here, or call 873-SPCA today! Make a one-time donation by clicking here, or call 873-SPCA today! GIVE TODAY! CALL 873-SPCA NOW! Did you ever think about what our community would look like if the SPCA Serving Erie County didn’t exist? On December 13, tune in to our 15th annual Radiothon on Star 102.5 FM and WBEN 930 AM from 6:00am – 6:00pm. Both stations will be broadcasting live from the SPCA’s shelter at 300 Harlem Rd. in West Seneca and will highlight this year’s theme: You Never Know When You’ll Need the SPCA. Hear why the SPCA matters to those who never knew they’d need us…until they needed us! Or, stop by and join in on the fun! It’s an all-out open house at the SPCA, with half-off adoption specials, shopping deals in the Petique, Lights of Love, an SPCA expo in our Education Center, food trucks, and more! Click on the links below for more details. Have you or those you love been impacted by the SPCA and our animals in some way? Have you needed us to make your family…your home…your life…more complete? Then make your Radiothon gift today…or become an Angel for the Animals with a pledge of $15 or more a month for 12 months. Click here to listen to Star 102.5 FM. Click here to listen to WBEN 930 AM. Come visit us at 300 Harlem Rd., West Seneca during the Radiothon! Broadcasts by Star 102.5 FM and NewsRadio 930 WBEN will be happening live 6:00 a.m. – 6:00 p.m. (animals cannot be viewed until 9:30 a.m.). There will be plenty of activities for you and your family to enjoy! 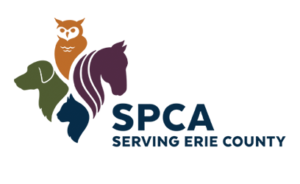 Open House: Learn more about the SPCA and how the money raised from Radiothon supports our programs and services. Meet and greet staff from various departments, participate in activities, and interact with live animals. Interested in adopting? Receive 50% off of your adoption December 13th ONLY, 9:30 a.m. – 8:00 p.m. at our West Seneca shelter! Get a bite to eat. The Cheesy Chick Food Truck will be available 11:00 a.m. – 1:00 p.m. Souped Up Food Truck will be available 1:30 p.m. – 3:30 p.m.
Shop our Petique. Keep an eye out for special deals available this day! Make a donation in person to support the animals in our care. The first 50 people who visit in person and make a donation of $50 or more to the Radiothon will receive a Buffalo Sabres hockey puck signed by goaltender Linus Ullmark! Take a tour of our shelter. Take a break from holiday stress and shopping to spend some time with Paws for Love therapy dogs. Buffalo Sabres’ goaltender Linus Ullmark is teaming up with the SPCA to get more dogs a home advantage! Details here! Give a gift that will really touch their hearts — and spread holiday cheer to less fortunate animals in the care of the SPCA Serving Erie County. Buy a light in honor or in memory of a special person or pet for anyone on your holiday list and a card will be sent acknowledging your gift on their behalf. Lights will be placed on trees in the SPCA’s Adoptions Lobby. Funds raised will go towards giving animals a second chance at a happy, healthy life. For one day only, ALL animals at the SPCA will receive 50% off of their adoption fees! This adoption special is happening only at our 300 Harlem Road, West Seneca location, with extended Radiothon adoption hours: 9:30 a.m. – 8:00 p.m.
View our adoptable animals by clicking here. –Jim and Dan and George and Gracie and Jack and Jill! Click here to view photos from our 2017 Radiothon. Click here to view photos from our 2018 Radiothon.